The 2016 Dodge Durango pushes the limits of what a midsize SUV can be. It's only a little smaller than the Chevy Tahoe, and with an available V8 engine it's capable of towing a best-in-class 7,400 pounds. However, the styling inside and out is sleek and modern, and the Durango handles big-family needs in a modern and easy-to-drive SUV. The Dodge Durango is an excellent choice for moms with attitude. My only complaint about the vehicle is that I can't do speech to text when replying to text messages. There are predefined text messages I can reply with. Also, I guess, another complaint I have is that I can't turn off the auto start and stop like, for always. You can disable it, but you must do so each time you get into the car. I really enjoy everything else about the vehicle! It's spacious enough for my family, and it hauls like a dream. We use it to pull our pontoon with no issues. It also is pretty quick. I was nervous about going from a small fast car, to a bigger vehicle because I like to take off a little quicker, and it does it just fine. Great family car that packs a punch. I think that my Durango is one of the best cars I have purchased so far. I got the rt with the hemi v8 and I absolutely love the power and performance of this vehicle. It's a mom car that still packs a punch and is fun to drive everyday. I love that my car has great safety features like blind spot monitoring and adaptive cruise control. These come in handy when driving in traffic. I bought my Durango brand new and haven't had any issues with it mechanically. Its pretty inexpensive to maintenance which is something else I enjoy about this car. I am looking forward to doing business with Chrysler Dodge Jeep in the near future for another vehicle. The Dodge Durango, it is a very big-spacious and reliable vehicle. I love it and my family loves it. I have a family of 6 so with it being so big it is great for taking the kids to school and everyone being able to ride at once. Never had any problems with it at all and I do not plan on getting a different car any time soon unless it decides it wants to break down and give up on me but that seems highly unlikely and with that being said, I say thank you Dodge for being reliable. 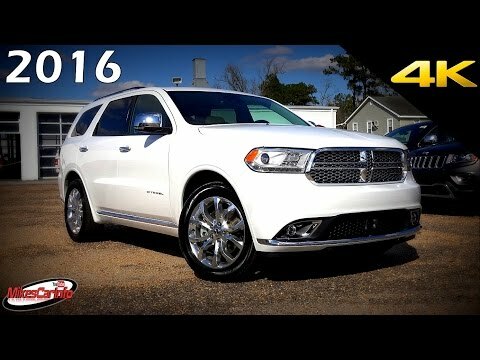 2017 Dodge Durango Review and Road Test - DETAILED in 4K UHD!